Egyptian Court Sentences Morsi To Life, And Then To Death : The Two-Way The rulings in Cairo confirm sentences against the ousted leader that were handed down this spring. NPR's Leila Fadel says "the cases have been criticized as show trials with fantastical accusations." 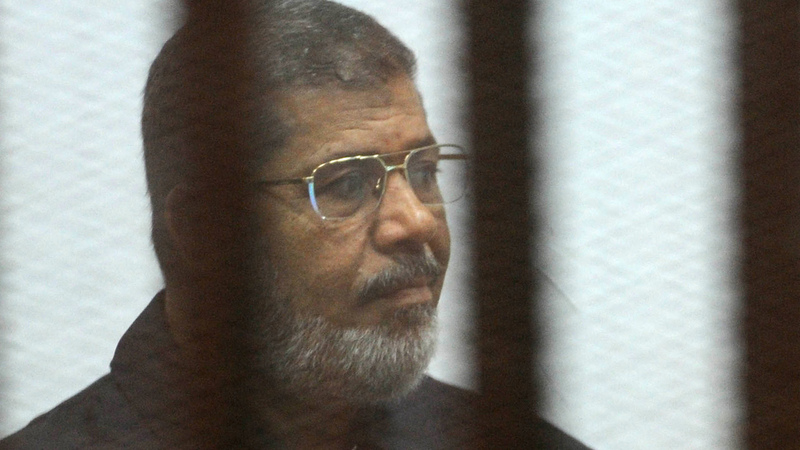 Former Egyptian President Mohammed Morsi can appeal his death sentence. He's seen here in the defendants' cage earlier this week, in a criminal court on the outskirts of Cairo. Nearly two years after he was removed from power, former Egyptian President Mohammed Morsi received two severe punishments Tuesday: life in prison for espionage charges, and a death sentence over a prison break. The rulings in Cairo confirm sentences against Morsi that were handed down this spring. NPR's Leila Fadel reports, "The cases have been criticized as show trials with fantastical accusations." "Morsi's death sentence comes after a conviction in the case of a jail break in 2011 during the uprising against Mubarak. He and the other defendants are accused of working with the Lebanese militant group Hezbollah, the Palestinian group Hamas and armed groups in Sinai." Morsi and his fellow defendants can appeal their sentences. "In total, 116 people were sentenced to death in both cases," Leila says, adding, "all but nine were sentenced in absentia." The prison break took place in 2011, during the Arab Spring uprising that brought down former leader Hosni Mubarak. In June of 2012, Morsi was elected as Egypt's new president. Just over a year later, he was removed from office by the military.